Perfect for a narrow hallway or a small foyer, the Amish Mission Entryway Storage Bench with Mirror offers instant charm as you open the door. 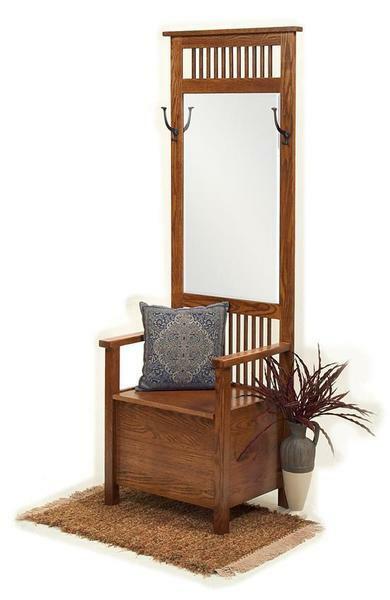 This lovely entryway bench features the gorgeous mission style. Slats in the bench back as well as along the very top of the display are mission classics, revealing a style that will blend with many design decors. Come on in and enjoy your space with this storage bench to serve you. Hang up your coat and sit comfortably as you change shoes. Tuck a backpack or handbag inside the storage bench provided. This mission bench is shown in beautiful oak wood with harvest stain. Oak furniture displays a heavily defined grain pattern that reveals the quality and beauty of the solid wood. Choose from oak, cherry, quarter sawn white oak or brown maple wood for this beautiful mission storage bench. A beveled mirror is featured which will come in handy for last minute outfit and hair checks as you head out the door. Keep your favorite sweater or coat right where you need it with two mission hooks provided. This oak furniture is Amish made in America, promising you quality and style that you can count on.